Let’s face it, cooking for a crowd can be complicated. As an adult, the holidays can be a stressful time of year, with increased responsibilities and relationships under pressure. 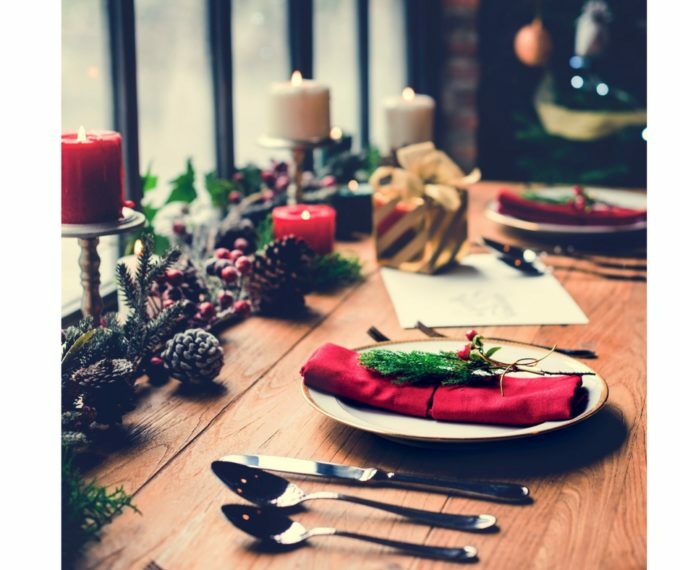 Sharing a meal over the holidays is meant to bring families closer together but sometimes the pressure to fit into the “Hallmark card” feeling makes fragile relationships even worse. Christmas is the time of year to be perfect. Add to this everyone’s individual dietary requirements and it’s obvious the person most at risk of a holiday meltdown is the host. Here is a dish to bring a smile to your face. It is an utterly delicious rolled pasta dish that happens to be vegetarian. Even meat lovers will not mourn the lack of meat. You can buy fresh pasta sheets or kill two birds with one stone and let the children roll the pasta (babysitting and cooking all in one). 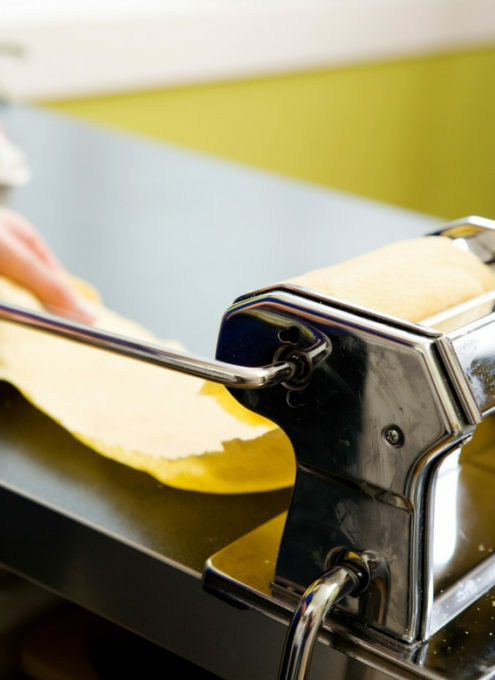 The pasta roll can (and ideally would be) prepared a day in advance and poached 20 minutes before serving. If there is a delay, no problem. Pop the sliced pasta into a baking pan and drizzle with butter or tomato sauce and bake it in the oven until ready. 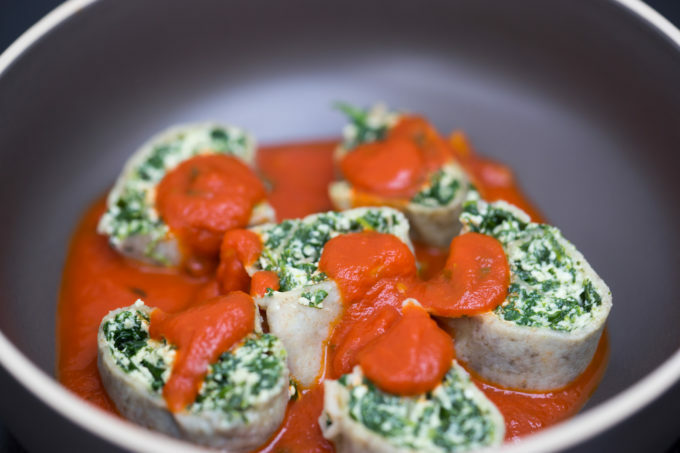 This is the vegetarian version of a classic Emilian dish that includes chicken giblets, sausage, minced veal and liver in the filling. The vegetarian version is popular with meat lovers and vegetarians alike. It can be served drizzled with melted butter for a creamier flavour or with tangy tomato sauce to contrast nicely with the creamy ricotta filling. For illustrated step-by-step instructions, click here. Fry the garlic in the olive oil or butter in a large saute pan over medium heat until the garlic is coloured. Add the spinach and cook until soft, about 3 minutes. Discard the garlic. Strain the spinach, squeezing out any excess liquid. Chop the spinach up finely. Mix the spinach with the ricotta, Parmigiano-Reggiano and salt and pepper to taste.